I love to play in my studio. So much so that I have boxes and trays of 'one-offs' that were either little experiments or tryout pieces for something that either never got finished or ended up not needed. Orphans. They're valuable little orphans for they opened my eyes to a new technique or proved I could do something with the clay that I had only envisioned in my sketchbook. But they seem a bit sad this time of year-- they want to evolve, to become a part of something larger. So to end up 2011 I decided to give them all homes in earring sets. Or at least 12 sets-- it resonates somehow with 'The Twelve Days of Christmas'-- “12 pairs of earrings, 11 lords a'leaping, 10 ladies dancing”, etc. These are going immediately into my Etsy shop or they'll end up being worn by me! For all of you who are doing some late shopping or just because we all need to gift ourselves sometimes-- for whatever reason-- here are my offerings and please enjoy the eye candy. They're the only sweets this holiday season that won't go right to your hips! I'm rushing to get these listed in my Etsy shop but if you fancy a particular pair, please convo me at Etsy and I can put a Reserve listing up for you. And from our house to yours--have yourselves a Merry Little Christmas! Numbers have great significance in many cultures. 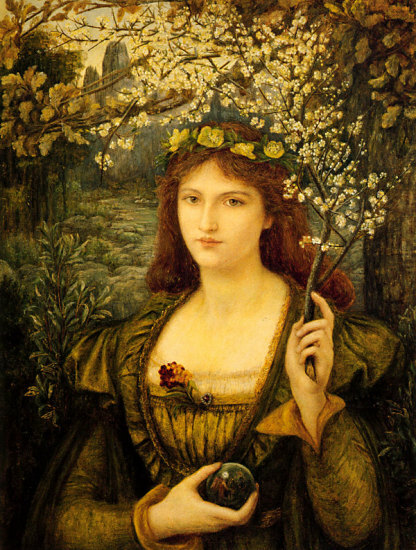 In Western culture, the number “3” philosophically describes the Deity in both Christian and Celtic societies. In Navajo culture, “4” represents Nature's essential elements-- wind, water, air and fire. The discovery of the zero allowed civilization to advance in science and mathematics. Numbers represent our birthdays, wedding days, holidays and significant dates in our world's history. But as designers, we just love numerals because of their unique graphic appeal. They are like ancient runes, significant because of what they represent but pictorial in their aspect. They are modern hieroglyphics, language and design all together. I love browsing typeface sites like Dafont.com-- so many cool fonts that drive my imagination wild. I used to work in a graphics department and I've never lost my love for letters. But recently I was invited by the folks at Create Mixed Media, publisher Northlight Books' blog, to create a set of numerals for this week, December 11-17, for the blog which they call "The Week as Art". Seven days' worth of numerals are depicted by a different mixed media artist every week. I decided to make mine in polymer clay and embellish them with lots of texture and color. Here they are in full size. If you haven't discovered the Create Mixed Media blog, head over there to check it out. 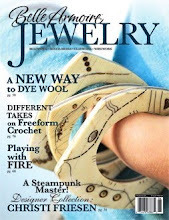 There are lots of informative and interesting posts by both editors and guest editors on wide-ranging topics of interest to anyone interested in jewelry-making and every kind of mixed media, covering everything from art retreats to setting up a home studio or marketing your work. 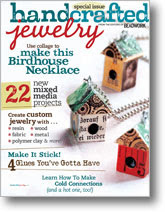 This week on Thursday, December 15, there is a webinar by my friend, Barbara Lewis, author of Torch-Fired Enamel Jewelry. Registration is free but be sure to reserve yourself a place. It's been over a week since I taught my first class at this year's ArtBliss outside of Washington, D.C. I'm still full of happiness at meeting all my great students and all the wonderful friends I only knew from online conversations and from all the super-positive feedback I've received from everyone at the event. I work in a home studio in a rural area and the majority of the feedback on my work comes from comments on photos posted on this blog or on Flickr. Hardly anyone sees the pieces up close and personal so it was a real treat to see how people reacted to my display of work at the Meet & Greet. 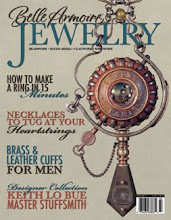 I had brought most of the pieces that I made for my recent article in Belle Armoire Jewelry and I was very gratified by the reactions of the attendees. As I commented to Cindy Wimmer, a good friend and co-organizer along with Jeanette Blix, it's like storing up sunshine from a fine summer's day. When I think about it--with the cold autumn rain coming down outside my window for a week now-- it's warming and energizing and I can't wait to start planning another class for next year! I'm so curious about how what they've learned will influence what my students do next in their own individual art-- I do so hope that their experience in my class will have some positive effect, some lasting inspiration. Because that's why you teach-- not to become a millionaire. Organizing and schlepping close to the entire contents of one's studio to a venue is exhausting and teaching an all-day class at peak energy is like running a marathon but I would not ever turn down the opportunity to do it all again. I only have a few photos of the event to add to this post, as I was so engrossed in what I was doing and making sure I covered all the material that I forgot to have someone take photos! Luckily, one of the ArtBliss staff took a few. I'm planning on contacting all my students soon and asking for some shots of finished or work-in-progress pieces. When we got to our suite at the hotel, a fabulous bag of goodies was waiting for me-- including an antique stand used by offices to hold those old-fashioned stamp pads with handles. Cindy knows what an inveterate antiques hound I am. Doesn't it have the perfect patina and woodsy style as a holder for my Passion Flower brooch? I think I'll keep this one right on my desk staged just like this! I adore antique jars too and this zinc-top one is full of shells that Cindy's boys picked up on one of their last days at the beach this year. I'm thinking that each and every one of these was specially chosen by one of them and imbued with their happiness and wonder. What a very special memento, with its tag “Near the Sea we forget to Count the Days”! And to accompany it was a big, fabulously-illustrated book on shells. 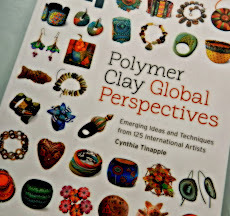 I can't wait to delve into this one and create some new patterns in my clay work. One of the reasons that I teach is that I come home filled with new ideas and enthusiasm for my medium, polymer clay. I am so blessed to be able to pass that on to others but an equally special reward is that they re-inspire me. One of my students gave me some wallpaper squares that she brought to class. Thanks, Judy, and here are some little samplers I made with the textures. I used Genesis heat-set oil paint for the black base and highlighted the designs with silver gilders paste. Some of these may end up as bases for owl or dragon eyes for my porch pumpkins this year. Students also let me make copies of some of the mold-making originals that they brought to class. Finally, a few class pictures. If you go to the ArtBliss site and the instructors list, you can see other shots on their blogs. It's not as good as being there but maybe it will get you thinking about attending next year and joining the fun that we all had-- being together, talking about mixed media for three days and hanging out with good friends. It doesn't get any better than that! Gigantic thanks to Cindy and Jeanette for a well-run, energizing, and totally enjoyable event! I felt very taken-care-of by both of you-- you thought of everything! And special thanks to my students for being courageous, inquisitive, energetic, affirming and completely wonderful! Life is Just a Bowl of Soup-- Bead Soup, That Is! 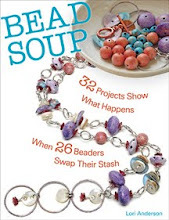 The Bead Soup Blog Party is a large collaboration project, brainchild of Lori Anderson, for lovers of beads in which each beader is paired up with another and tasked with sending the following: a focal, a special clasp (not just a lobster claw) and some coordinating spacers or beads. Using the focal and the clasp is mandatory, but anything from your own stash can be used to round out the rest and you can choose to use the coordinating beads or not. 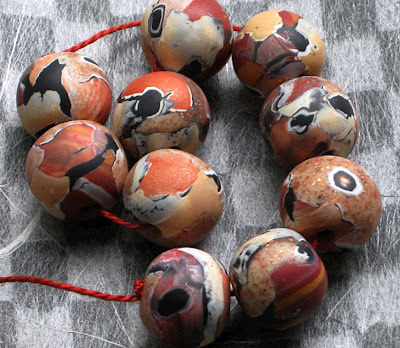 In my opinion, the real challenge is to make something in your own style using someone else's interpretation, expressed by the style of the components of the Bead Soup that they send you. 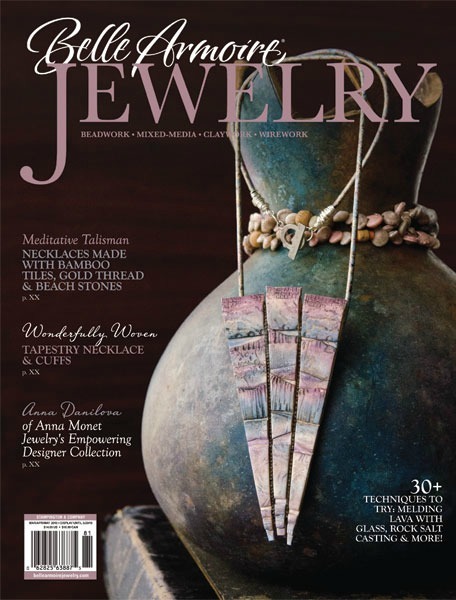 My partner was Cynthia Deis, jewelry designer and owner of Ornamentea. The focal she sent was a beautifully-crafted lampwork bead with a tree theme by Lisa Daly, the clasp was a handmade by Cynthia, and the accompanying beads were small Elaine Ray ceramic forms and beads and some Czech glass leaves and faceted rounds. Now my style is more tribal and usually incorporates large elements. My beads have a soft sheen and are not shiny. Gone are the days of Flecto Varathane for me! But lampwork is shiny and glimmery, so how to incorporate it into my own style? I had to solve the same issue in my previous BSBP piece, Mistress Boleyn's Necklace, so after some musing, I came up with gilt! In the tease post I did for this year's BSBP, I showed a piece of polymer done in multiple gilded colors to mimic a wooden Indonesian screen. I decided to use the same technique to frame the lampwork focal so its jewel-like glow was set off and enhanced by metallic paint. Since the theme of the focal was a tree, I decided to use woodgrain and branches as a background for the polymer “bezel”. Lately I've been influenced yet again by an HBO production-- The Game of Thrones-- in which gardens dedicated to the old gods are planted with trees called “weirwoods”, so I used handcarved branches on a woodgrain textured background to hold the focal and provide a surface for texture, color and gilt. 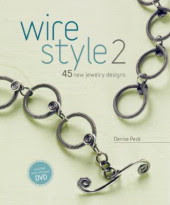 The same technique used for the layered bezel also created the three-strand connectors that hold the beaded wires. Now, how to incorporate all the small beads into the design? I've been using wire-wrapping a lot lately so the solution was to wrap and string them around forged strands of heat-patinated copper. I drew the patterns onto paper, enlarged them on a copier and used them as templates as I worked. They were then attached to the focal piece with polymer, textured and cured in place. The amazing thing about polymer clay is that it can be cured again and again without harm so layers can be built up and wires can be held in place. After adding layer upon layer of color with heat-set oil paint, acrylics and gilders paste--a technique I'll be teaching in a workshop at ArtBliss in D.C. next weekend--I decided that simple bookchain links in copper and steel would be appropriate to match Cynthia's clasp and finish off my gorget. (def: a metal collar designed to protect the throat, later used as an ornamental accessory on military uniforms). As I've said before, I believe that perseverance is the key to compelling design – to keep working into it, adding layers of color, shape and texture. I design with the intent that when people see my pieces, they are inspired to invent a story about them. With “Norweigan Wood”-- my title for this piece-- I hope I've achieved my goal. 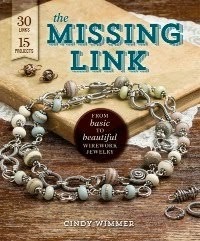 Here's the link for the entire list of 362 participants/partners of the Bead Soup Blog Party. Grab a cup of coffee and have fun-- there's lots of great design to enjoy! And thanks for visiting! 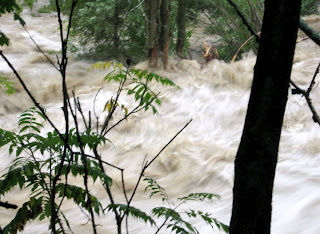 If you were on high ground in Vermont two weeks ago watching as Tropical Storm Irene sent sheets of rain down for twelve hours, except for a fairly warm drenching there wasn't much happening. All the battening down of lawn furniture and picnic table umbrellas proved unnecessary since the predicted Category 2 winds never developed. Of course the power went out about four hours into the storm for four days but we were prepared for that. We had water, oil lamps, crank-up radios, food and plenty to read as we hunkered down in our one-story workshop situated in our field and out of the way of tall trees. As the rainfall rate started to crank up, my husband and I went outside to get a better view of the teensy stream that runs at the back of our acreage, which was cresting its banks with leaping waves and had begun to flood the lower parts of the property. Happily, it had avoided our newly-planted apple grove and blueberry bushes. A wide, shallow river of muddy water was rushing toward a confluence with the larger stream whose course runs a few feet from our driveway, flowing from the hills across the road, under a small bridge and down to the Third Branch of the White River. 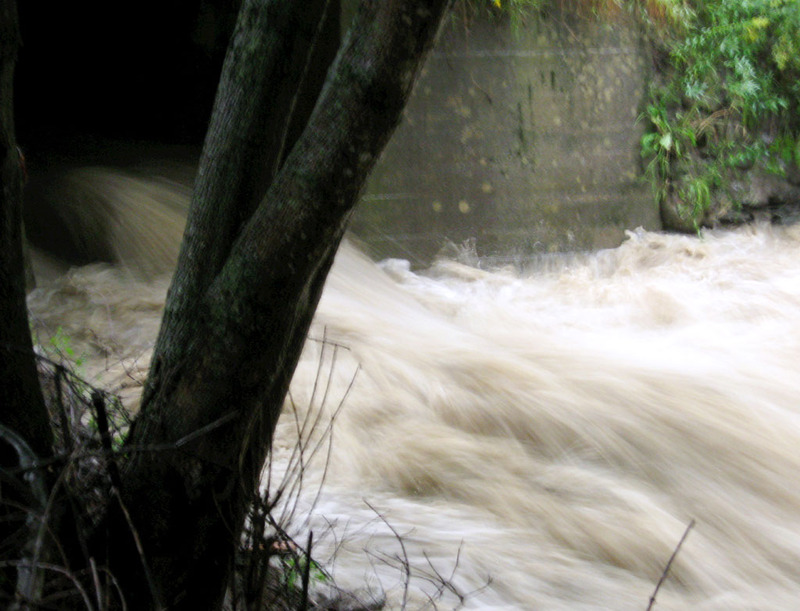 When I bought this house in 1994, I made sure it wasn't in a flood plain but I also guessed that once the water flowed under the little bridge it had a wider place to go and therefore wouldn't rise to the top of our bank, 12 feet or so above the streambed. 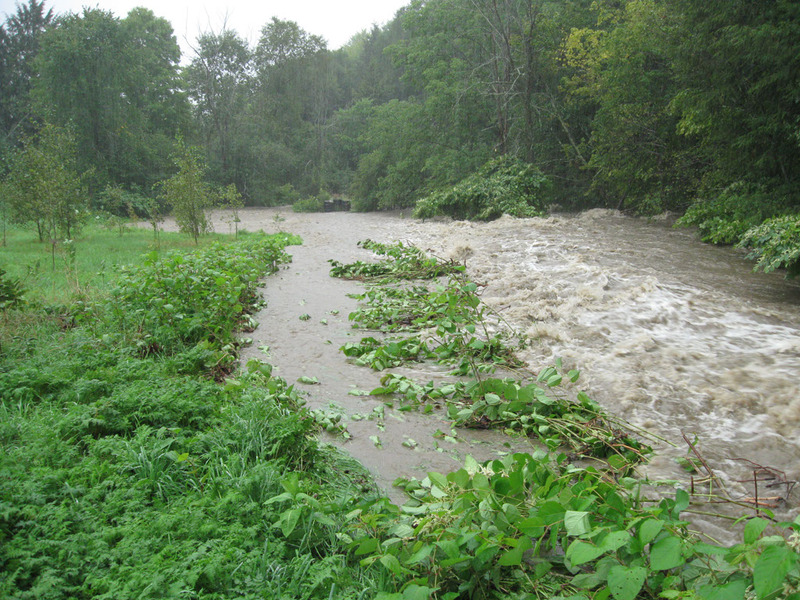 My gamble was correct and although Douglas snapped photos of the water's crest coming to within a foot or so of the roadbed of the bridge, severe damage was avoided except for a total rearrangement of the stream's course as well as some physical features of the landscape downstream. I also knew that our home, which is post-and-beam construction and built in 1830, had withstood the historic Vermont Flood of 1927. It had, in fact, sheltered men from the community who stayed here overnight so they could keep one bridge open off Braintree Hill by fending off large trees that were washing down the streambeds and threatening to demolish the bridge. We had experienced major flooding from a summer storm in 1998 and lots of roads in our nearest town, Randolph, were severely damaged that year. 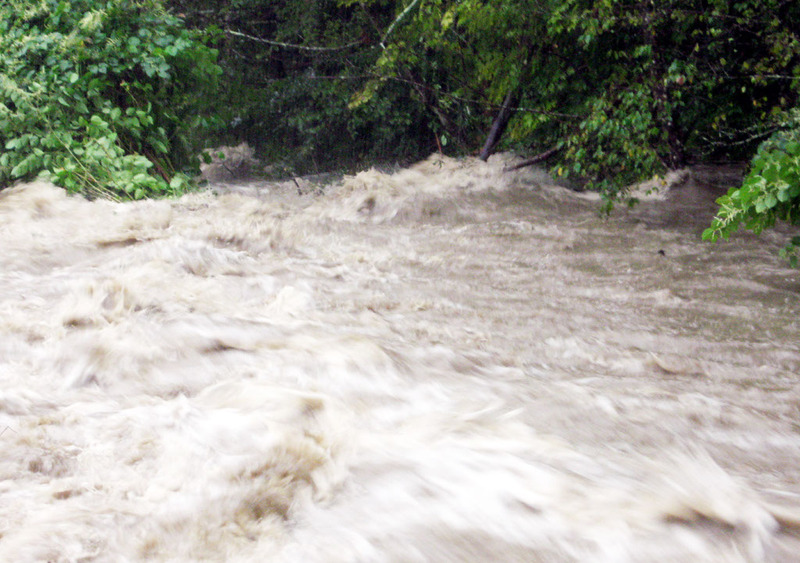 Earlier this spring, major work was done to replace aging culverts and this work was well-justified, as those previously-damaged areas came through with flying colors. The Amtrak trestles didn't do so well. In two sites the track was seen suspended in mid-air with nothing underneath for 20 feet. 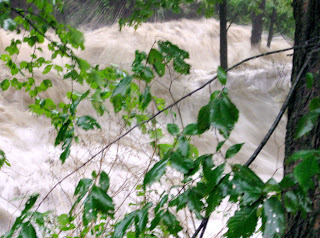 Monday after the storm we ventured into town to get a cell-phone signal so we could call relatives and let them know we were ok. We began to see saturated furniture and household goods piled in front of homes and farms. Boulders and large trees were left in the middle of flattened hayfields, like strange sculptural installations. Stands of ripe corn were covered with gray mud. Parking lots had collapsed into streambeds, giant bites taken out of the asphalt. Stores had their doors open but without lights. We checked our local Aubuchon's Hardware and they told us generators were on the way. Shaw's Supermarket was running on generators but the shelves were still reasonably stocked. Randolph Village, which had been so hard hit in the Flood of '27, had survived the worst. At least our floodwaters had receded. But many of our tiny villages and communities are still isolated and without power or a way to get out except by foot almost two weeks later. My husband's company had watermarks 5 feet up and mud all over their offices and manufacturing facilities. They will rebuild but it will take months and lots of physical labor and help from a backhoe. It's hard to believe that in 2011 our civilized world could be dealt such a blow from the forces of wind and water. You read about the tornados and the earthquakes and the tsunami but until the water's at your door, it doesn't seem real. 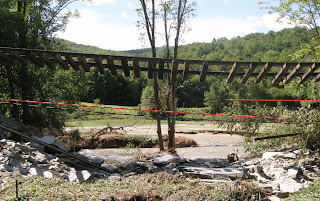 We are lucky in Vermont that we still have some time to fix roads and find shelter for those whose homes were demolished before winter and the inevitable cold arrives. 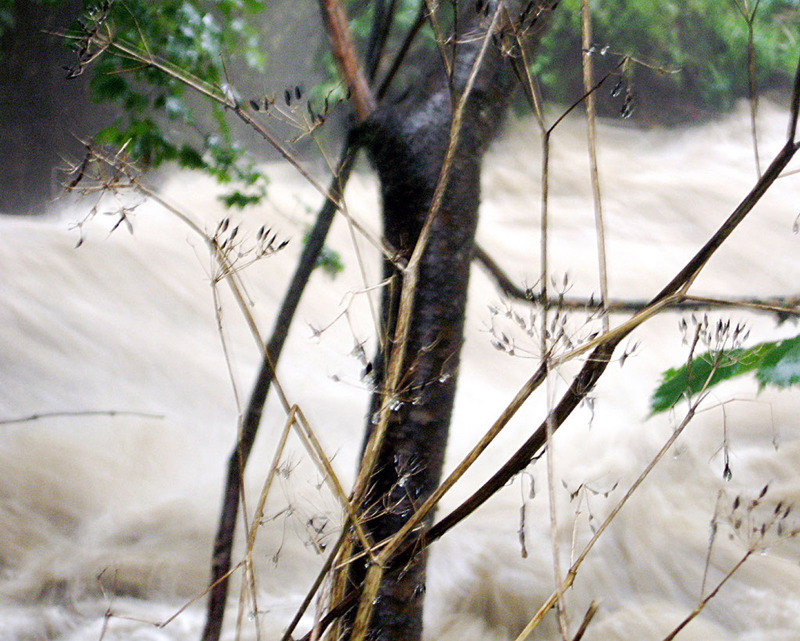 But the courage and fortitude (a word hardly used anymore) of my neighbors in dealing with this crisis makes me proud to be part of this community-- we're not whining, we're not looting, we are being generous with our resources and our homes, we are rebuilding by using our own hard work and hands, we are helping each other. In earlier times we did the same. 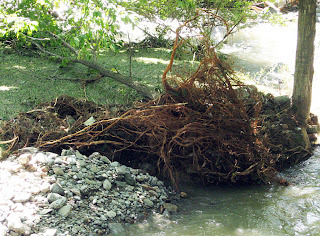 It seems adversity serves to renew our trust in each other and our interdependence as a community.